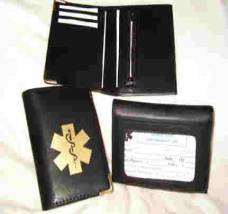 Street Smart Vinyl Medical wallet, This Street Smart vinyl bi-fold Medical wallet is a smaller wallet and the size compliments it's comfort. Features 2 metal gold corners, a gold medical symbol hot stamped and a clear window on the outside. Inside there are 3 credit card slots, 1 zippered coin/key pouch and 2 pockets 1 on each side. That's it, simple, small and thin 4 1/8"H x 3"W closed. Hipster Leather-Like Medical Wallet This Hipster leather-like bi-fold wallet are smaller and thinner then most bi-fold wallets for extra protection on your hip, hence the name Hipster wallet. 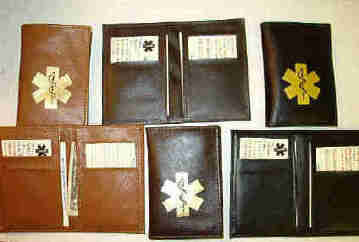 These Hipster leather-like bi-fold Medical wallets have the feel and look of tumbled textured leather at a fraction of the cost. Inside the Hipster leather-like bi-fold wallets are 6 slots and 2 pockets, one on each side. Solid construction with an edge-stitched seam and a reinforced spine. That's it, simple, small and thin. 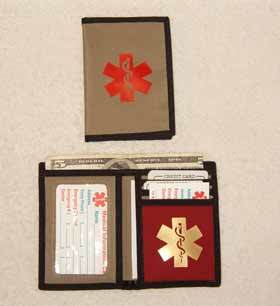 'Travel Lite' Medical wallet, The vinyl in this wallet is the burgundy panel inside making this wallet very attractive, displaying a Gold color medical symbol. This sporty lightweight design constructed of Khaki nylon Micro fiber and is finished with edge-stitched piping creating a sturdy Medical wallet. 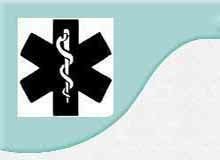 A medical symbol is in red on the outside. The edge stitched piping is continued inside with 3 credit card slots, 1 small currency holder (see the $5 folded on the right) and 2 pockets (one is clear). The combination of these material and colors makes this wallet very attractive. Size, 4.5H x 3 1/4"W closed.